Clay's Southwest Flavors is located at the A la Carts Food Pavilion (SE 50th and Division) in Portland, Oregon. Clay and Cherise run this food cart. About a month ago, I returned to Beth's Cafe with some YouTube friends to take on the (unofficial) 12-egg omelet challenge made famous by the TV series "Man v. Food." A long-overdue trip to Salvador Molly's was in order. Nothing to sear my taste buds today. Just a good ol' game of "let's dine in, look at the menu, and pick something that really sounds awesome." I've already addressed it on Facebook and Twitter, but earlier this month, I surpassed 1,000 YouTube subscribers. A final push from three larger channels got me past a mark I had set as a stretch goal to hit by the end of the year. I can't thank people enough for all their support. 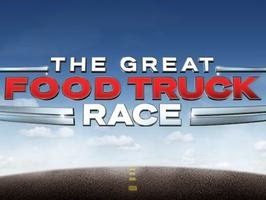 It took four seasons, but The Great Food Truck Race finally filmed an episode in Portland, Oregon, for the upcoming season. The season should start in late August 2013. Seven teams of food truck owners made their way from San Francisco to PDX and sold their food on Saturday (May 18) and Sunday (May 19). Paseo Caribbean Restaurant has two locations in Seattle: one in the Ballard neighborhood and another in the Fremont district. This trip covers my Ballard experience on Seaview Avenue NW. Just a few minutes after opening at the Ballard location! I've met a bunch of cool people in 2013, and Cinco de Mayo weekend was my chance to meet the guys from the YouTube channel Cult Moo. If you haven't seen their channel, check it out. Senor Guerro and Herr Pink have a lot of great shows that should keep you entertained for hours. Potter's Kolaches and Coffee is located near SW 3rd and Burnside in downtown Portland, Oregon. The cart is across the street from Voodoo Doughnut. Mother Goose Bakery is located at the Cartlandia food pod in Portland, Oregon. Owners Doris and Greg opened this cart in early April 2013. NOTE: This cart also doubles as Pi Woodfired Pizza in the afternoons and evenings, run by nephews Dallas and Aubrey. I'm planning a separate review on their pizza in a few weeks. Traditional Russian Cuisine is located at the Cartlandia food pod in Portland, Oregon. Food Carts Portland posted a profile on them almost three months ago. The Good and Evil Wrap Company is located at the Cartlandia food pod in Portland, Oregon. It's still a fairly new cart; owner Tim opened this cart in March 2013. The 2nd Annual Kelly's Jelly Challenge took place from April 17 to April 23, 2013, in Portland, Oregon. Owners of six great Portland food carts participated to see who would create the best dish using Kelly Calabria's habanero jelly.